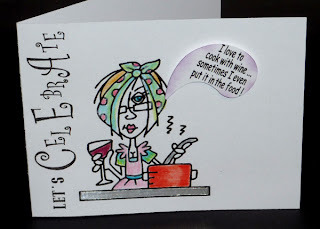 I was asked to be a guest designer on Quirky Crafts blog challenge and to use a Bugaboo digi stamp. The theme is "Food Glorious Food". As it turned out I got two digi's. I wasn't that intrigued by the first image, so got one that was more "me". The funny thing is, when I printed the images out on my white card, I really liked both of them, they were clean looking, so hence I made two cards - Big Grin. 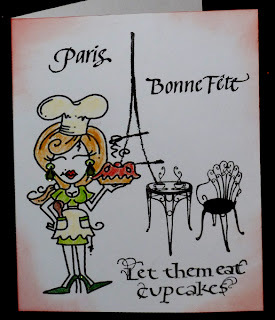 The first image I got was the chick holding the cake, and while I was percolating what to do with her, I decided to go "French" and use Quietfire Designs French phrases, Flourished Eiffel Tower & the quote stamp from the Let them Eat Cake set. I paired it up with a new stamp from Old Island Rubber stamps, the Cafe chair and table (it has two chairs, but I left one off). Everything was stamped with Versafine Black Onyx. I only colored the digi with colored pencils so it would stand out. Added teardrop green rhinestone earrings and green Stickles on the shoes (she definitely needed the glitz BIG GRIN) I liked the clean and fresh look of the white. I added just a touch of edging with Distress my dirty red sponger. The second image is one I chose and love the quirkiness of the chick... Again I kept the card simple, only coloring the digi with colored pencils and adding a piece of aluminum tape for the stove outline. Used a couple sizes of an alphabet stamp set (Just Rite "Brayton") to stamp the "Let's Celebrate" along the side. The blurb is part of the digi set and then I punched it out with a jumbo Fiskars punch, sponging some Dusty Concord around the edges. Thanks for sharing with us at One Stitch At A Time for our 'Use a Digi' challenge. These are both really great Yogi! 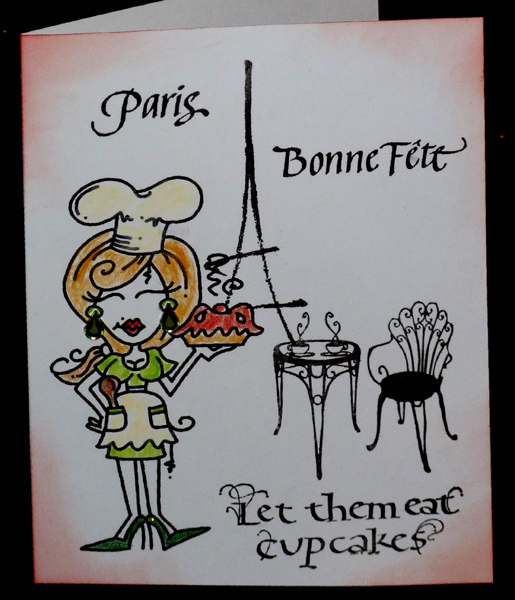 I too love the quirkiness of the chick on the second card, AND the way her mind works. lol Thanks for playing along with us at Opus Gluei! These are a real hoot, Yogi! The clean, white card is the perfect base for them. Love what you did. Happy new year! Cute cards Yogi. Thanks for taking part in the CES Challenge. Happy New Year! Great New Years Resolution... make more reservations! This is too fun. Thank you for joining in at the Opus Gluei! Great card and great sentiment- so clever!! Thanks for joining us at Pile it On this week! Fantastic cards. Thank you for joining us at CRAFT. great cards! I love those bugaboo images...so fun and sassy...thanks for joining in at the Opus Gluei this week! Hi Yogi and happy new year! Thanks for joining us at Opus Gluei with two great cards. I have to admit that the humor of both are right up my alley and these are great digis. I keep hearing a lot of good things about Bugaboo, I really must check them out and take the digi plunge! HA. Both of these cards are great. Thanks so much for playing along with us at OPUS GLUEI.